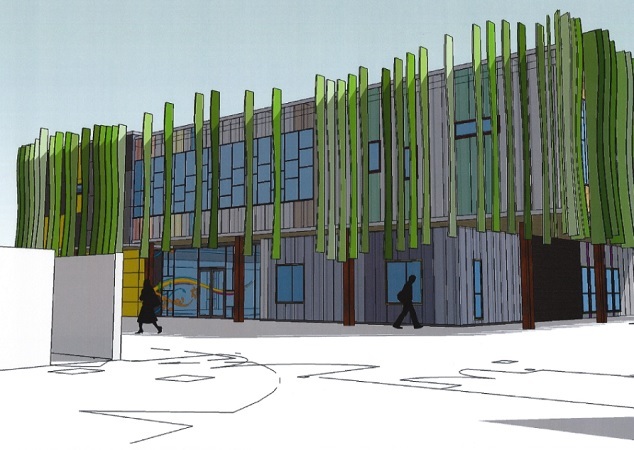 We have been commissioned to make and install a climate façade system as part of a £3m redevelopment of the school in the London Borough of Bexley. Architects Ingleton Wood’s imaginative design includes nearly 60 vertical fins on the building façade to not only provide solar shading but also to make an impressive visual impact. The fins will extend down the building to help protect classrooms, offices and halls from solar gain (six will also follow the curve of the roof to wrap around a ground-floor extension). However, it’s as a decorative feature that the fins will truly stand out. Coated in complementary shades of green, the fins will have a curved profile to create a wave-like effect that will be best seen from the side of the building.